Whoo hoo! Registration has opened for the 2nd annual CombatCon in Las Vegas. The hybrid, multi-genre convention was new for 2011, one of many exciting new events that opened their doors last year. 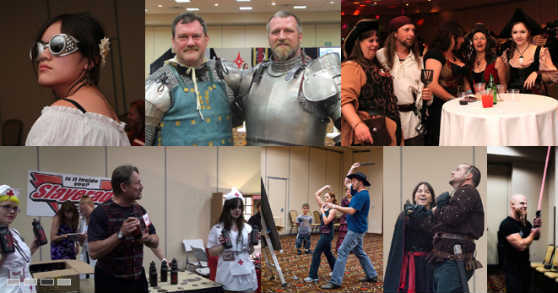 CombatCon, “Where History and Fantasy Meet”, is a delightful potpourri of steampunk, science fiction, horror, fantasy, and pirates all joined under the banner of the Western martial arts. What more could a person want? Early registration for CombatCon 2012 has opened. And, until the end of January, tickets are 33% off. That includes VIP and Premium level memberships, not just General. Get into the convention for the weekend. Normally $80, now $54 until end of January. Full membership plus priority seating at the panels and access to the hospitality suite from 1:pm on. Normally $150, just $100 until the end of January. Same as Premium level, only with all-day access to the hospitality suite plus box lunches Saturday and Sunday. Plus a few more benefits. Normally $250, now $168 until the end of January. CombatCon 2012 is scheduled for July 6-8 and will again be held at the Tuscany Suites & Casino. Children under 12 get free admission, but must be accompanied by an adult with a valid con badge.